Now Is Gone – Southwest. 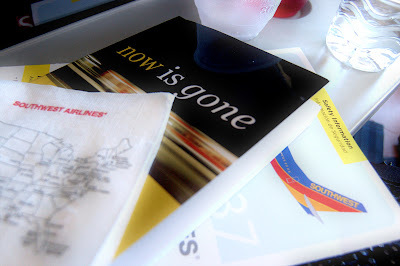 In heading to Seattle via Denver from Nashville, I committed to reading to Now is Gone cover to cover. To my surprise, on page 41 is a section titled “Social Media Success Story: Nuts about Southwest”. Where was I sitting? On Southwest Airlines. When I first boarded the flight it had completely slipped my mind that you could pick your own seat! Too cool… I was still a little spun around by the new way they call you to board the plane. It’s sectioned somehow, for some reason that still elludes me. Maybe people that pay more, get to board first? I didn’t meet a passenger that wasn’t confused by it (so maybe a better job of letting folks know would be SWEEET). I thought while on the flight, I’d ask the attendants about the blog mentioned in Now Is Gone. On the Nashville-to-Denver, none of the three I spoke with could remember hearing of the blog. Two were mid-20’s and both pretty hip looking (guy and gal). They had never been on Facebook either. The 3rd attendant was in her early 30’s as well. The length of employment with Southwest was 1, 5, and 6 years. They all love their jobs and are at Southwest for the long-haul. On Denver-to-Seattle however, I spoke with one mid-20’s attendant who had recently read the blog as she’ s been with Southwest in an office job and wanted to become an attendant. Her interest in the blog was to find out more about what the profession was like. She does have a MySpace page, has heard of Facebook in that it’s not as junkie, but will be staying put for a while. She also likes to read blogs from other stewardesses and pilots sharing their “stories” of encounters. Another attendant in her mid-30’s had only recently been on the blog to read more about the lady with the short skirt incident. They thought it was great that the company president had read all the many posts and then posted an appreciated comment about the whole ordeal. I’ve never been to “Nuts about Southwest“, but am committed to stopping by next time I have a connection. Southwest is still the darling of the sky. I wish you had been on my flight, I love it when e-savvy folks ask us about such related topics.